The Siem Reap Tourist Department reports a 23% increase in foreign visitors to Angkor, with the largest group of visitors coming from South Korea, but a sharp increase in Chinese tourists who are now the 4th largest group. 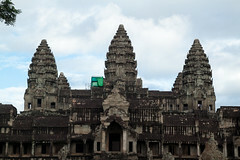 Cambodia’s Angkor Wat temples, one of the world heritage sites, attracted 1.6 million foreign visitors in 2011, an increase of 23 percent from 1.3 million a year earlier, according to the statistics of Siem Reap provincial tourism department on Tuesday. Among the top ten countries visiting the temples, South Korea was ranked first with 265,000 visitors, up 31 percent; Vietnam at second with 251,400, up 45 percent; Japan at third with 120,200, up 5 percent; and China at fourth with 119,900, up 81 percent. The statistics also showed that Thai tourists to the temples had slightly declined by 0.2 percent to 42,250 due to border dispute that led to armed clashes in February and April last year.